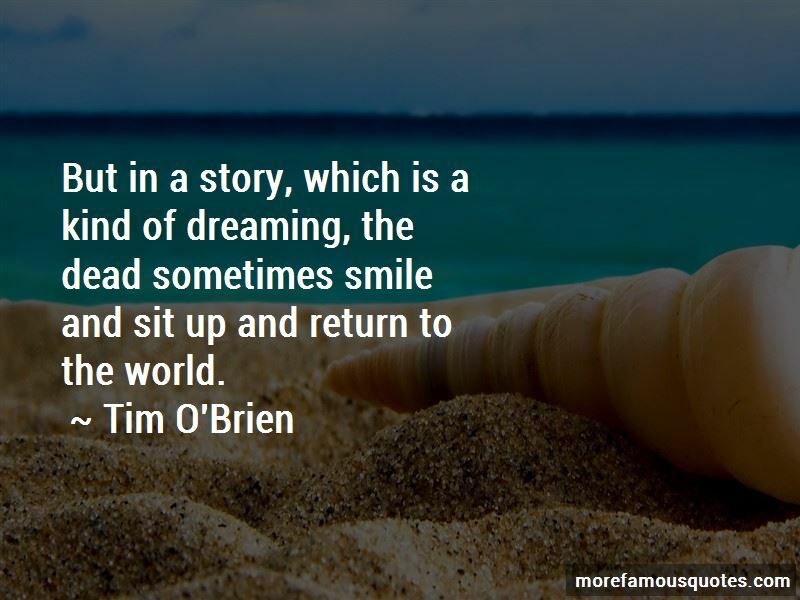 Enjoy the top 248 famous quotes, sayings and quotations by Tim O'Brien. His love was too much for him, he felt paralyzed, he wanted to sleep inside her lungs and breathe her blood and be smothered. We are fascinated, all of us, by the implacable otherness of others. And we wish to penetrate by hypothesis, by daydream, by scientific investigation those leaden walls that encase the human spirit, that define it and guard it and hold it forever inaccessible. Cease fire,' the lieutenants hollered. Cease fire,' the platoon sergeants hollered. Cease the goddamn fire,' shouted the squad leaders. That,' I told Barney, 'is the chain of command. There should be a law, I though. If you support a war, if you think it's worth the price, that's fine, but you he to put your own precious fluids on the line. You have to head for the front and hook up with an infantry unit and help spill the blood. And you have to bring along your wife, or your kids, or your lover. A law, I thought. She'd say amazing things sometimes. "Once you're alive," she'd say, "you cant ever be dead. It's sad when you learn you're not much of a hero. Anyways, the guys try to be cool. They just lie there and groove, but after a while they start hearing - you won't believe this - they hear chamber music. They hear violins and cellos. They hear this terrific mama-san soprano. Then after a while they hear gook opera and and a glee club and the Haiphong Boys Choir and a barbershop quartet and and all kinds of wierd chanting and Buddha-Buddha stuff. All the whole time, in the background, there's stil that cocktail party going on. All these different voices. Not human voices, though. Because it's the mountains. Follow me? The rock, it's TALKING. And the fog, too, and the grass and the goddamn mongooses. Everything talks. The trees talk politics, the monnkeys talk religion. The whole country. Vietnam. The place talks. It talks. Understand? 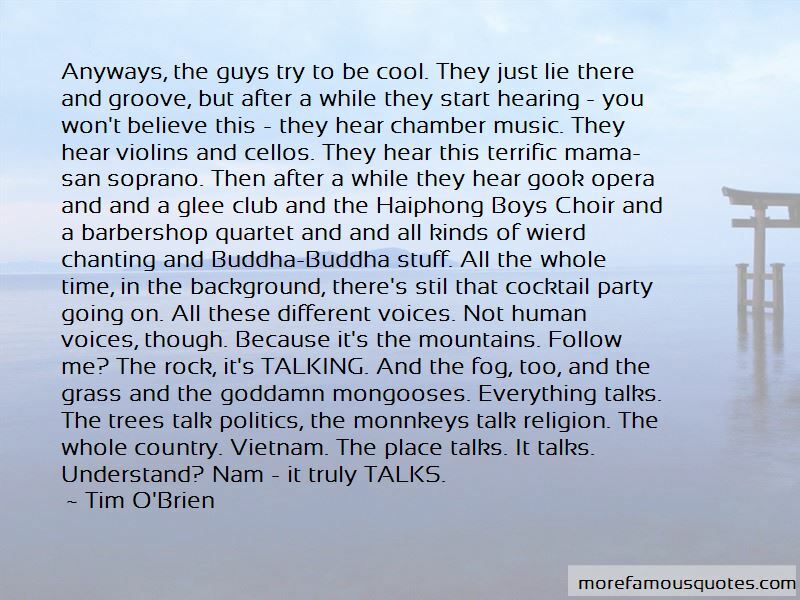 Nam - it truly TALKS. Love, as wonderful and horrible as it is, has at its center a kind of pitiful humor. If I see a phrase that strikes me as ugly, I'll delete it. Or, if I find a way to say something a bit more freshly than it was expressed originally, I'll do it. Ultimately, you want to try to leave behind the best possible paragraph or sentence. 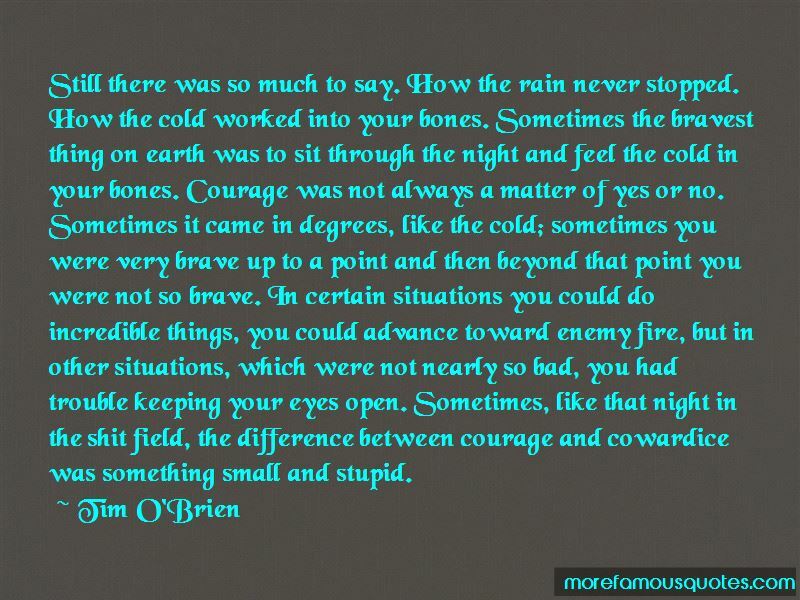 Want to see more pictures of Tim O'Brien quotes? 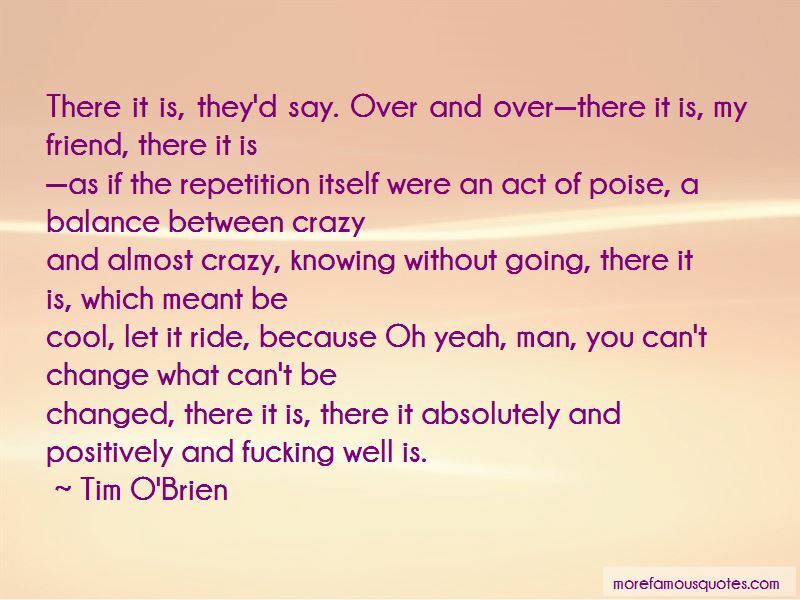 Click on image of Tim O'Brien quotes to view full size.